While there are several standard pieces included in a kitchen floor plan, each architect has a slightly different formatting style. 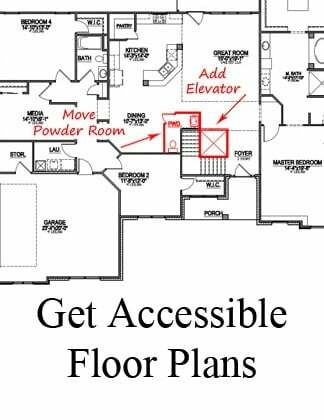 We've put together a quick guide on how to read a kitchen floor plan - to help you identify what special features are built into a plan you love. A kitchen floor plan design can indicate a seating bar island in several ways. In this example, the seating bar is RAISED up from the island. How can you tell if the bar is raised? There are no dotted lines indicating the end of the cabinets and the start of a bar overhang. 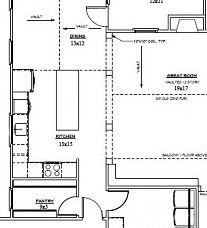 Some floor plans are more clear than others on certain aspects of the kitchen design. Here is an example of a raised seating bar, with a more clear distinction between the standard heigh island and bar. The thick black line indicates then end of the cabinets, and the dotten line indicates that the seating bar is raised. Architects usually indicate upper cabinets in one of two ways: a solid line or a dotted line. Floor plans by Frank Betz, a favorite designer for North Carolina new home buyers, generally show solid lines to distinguish upper cabinets. Plans by Alan Mascord, another favorite designer, generally show dotted lines. 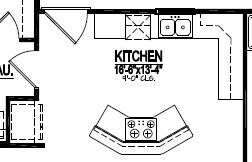 Here is an example of a kitchen floor plan design that uses the solid line drawing style. This floor plan, designed by Stanton Homes, uses solid lines to indicate upper cabinets. In this exaple, the pantry is drawn with double lines - indicating solid walls. Some plans will indicate solid walls with thicker black lines, instead of a double thin line. Helpful hint: Typically, the refrigerator will have a cabinetry pannel covering any exposed sides (in this case, the fridge would be covered on the side opposite the pantry wall). Click here to learn more about this floor plan - a version of The Bryson. 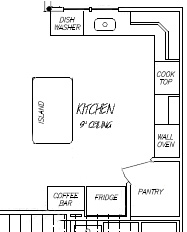 And here is an example of a kitchen floor plan design that uses the dotted line drawing style. Helpful hint: take a look at the appliances and fixtures. - The sink and range are drawn in solid lines - they are cut into the counter top, with no cabinets below. - The dishwasher and refrigerator are drawn in dotted lines - they are located above or below a cabinet. 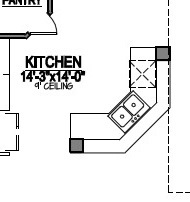 This solid line / dashed line distinction is very common for indicating appliances in a kitchen floor plan design, although some architects incorporate color to make the differences even more clear. Adding (moving, or enlarging) arched openings and entrances is a common request when building a custom kitchen plan. Architects usually indicate arched openings in one of two ways: by adding curved dashed lines or straight dashed lines between the walls. 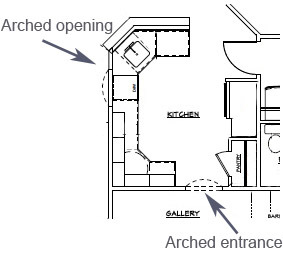 In this first example, curved, dashed lines indicate two types of archways: an arched cut-out opening between the kitchen and family room and an arched entrance between the kitchen and gallery connecting the formal dining room. In this second example, straight dashed lines indicate arched openings between the kitchen and great room. Open squares indicate decorative columns between the archways. Dashed lines also indicate the vaulted ceiling in the dining room and great room. Arrows and the word "vault" are included to distinguish the arched areas from the vaulted areas. Get a better idea of what this design looks like in real life - Click here to see photos of the Carwile - a completed version of this floor plan. Vaulted, coffered, and beam are three of the most requested specialty ceiling styles in custom home kitchens. 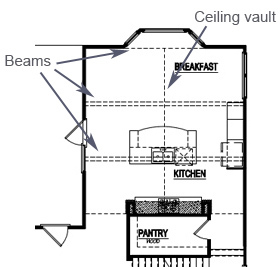 In this example, dashed lines indicate two ceiling treatments: a vault and set of three wood beams. 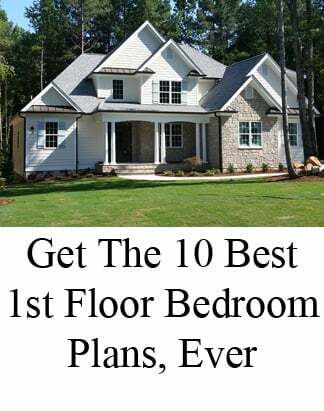 Click here to see a home built to this floor plan - the Country Manor. 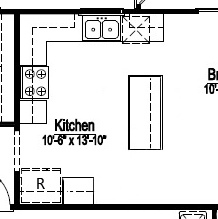 How do I know how tall my ceilings will be, according to a floor plan? 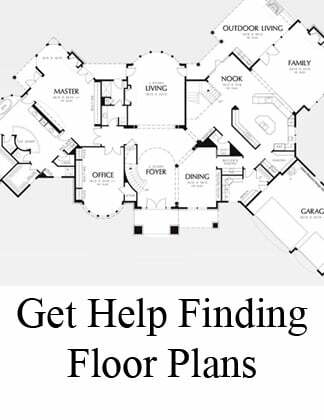 Some floor plans indicate ceiling height in certain rooms. 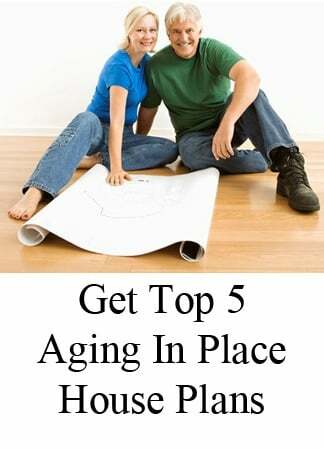 But ceiling height can vary by builder. Most new custom home builders incorporate a spacious 9 ft ceiling, and many popular plans also include at least one vaulted room. Make sure to ask your home builder what ceiling height comes standard. If you don't see a ceiling height specified in your bid or other documents, be sure to ask that it be included in the written information. Read more about a ceiling height.